Thanks to my mom for sending me this article, which I believe was written by Ron Krumer. "Against almost all odds, 28-year-old Arin Nasser gave birth to a healthy baby boy this week thanks to a unique procedure that involved removing, freezing and implanting slices of her ovarian tissue. Arin was born in the Arab village Gush-Halav near Safad in the upper Galilee with Thalassemia (a potentially fatal genetic blood disease) – her only hope was a bone marrow transplant. When she was 21, Prof. Reuven Or and Dr. Michael Shapira of Hadassah’s Department of Bone Marrow Transplantation performed the lifesaving procedure. But before the operation, before she was married, Arin was determined to make sure that some day she could have children. She turned to Hadassah for help. About two months before the transplant, Hadassah doctors removed exceedingly thin slices of her ovarian tissue with a special instrument originally developed by Prof. Eduardo Mitrani of the Hebrew University’s Department of Cell and Developmental Biology. Prof. Neri Laufer, Head of Hadassah’s Department of Obstetrics and Gynecology and Dr. Ariel Revel of that department collaborated with Prof. Mitrani in the development of the human applications for the instrument. The (bone marrow -r.i.) transplant took, Arin recovered, returned to her Galilee home in Gush Chalav and married. 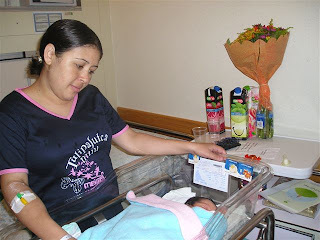 A few years ago, she returned to Hadassah – this time with the hope of becoming pregnant. In a unique procedure, Prof. Laufer and Dr. Revel implanted pieces of the frozen tissue and reconstructed her ovaries. The microscopic thickness of the tissue their instrument produced enabled Arin’s body to accept them relatively easily and without complications. Under the supervision of Prof. Alex Simon, Director of Hadassah’s In Vitro Fertilization Center, Arin became pregnant. 3 days ago she gave birth to her first child – both of them in good condition – and both resting comfortably in the Charlotte R. Bloomberg Mother and Child Center." Mommy & baby :-) Congratulations!!! At one point, nearly 20 years ago, I considered adoption. I had two options - one was adopting from the US, from a state where abortion is illegal and many babies are put up for adoption each year and the other was adopting in Israel, which was likely to involve a six year wait in order to get a baby. When I thought about it, I knew that I wasn't ready to accept just any baby. I wanted to know that s/he was healthy, that the mother hadn't used drugs or alcohol during the pregnancy, that the baby was normal... and then I thought that if my demands were so high, I just wasn't ready to adopt. That adoption should mean a willingness to accept any child who needed a home. Now, having my own biological children, I wonder. I wonder how I would feel about extremely violent behavior, for example. Or a child being terribly destructive. I wonder if it is easier to accept genetic predisposition to undesirable behavior when you know where it came from. Or when you know that later in life the parent was able to overcome it. What if the adopted baby grew into a person who had a really addictive personality and I had to spend years of my life struggling to keep the child on the right side of things? Would I resent that? Would I at some point question my decision to have become an adoptive parent? I’m prepared to be flamed and to hear how wrong / naïve / insensitive I am. I never adopted, I really don’t know what it’s like.